St. Croix Rotary Harborside gives laptops to students at Larsen Eementary. 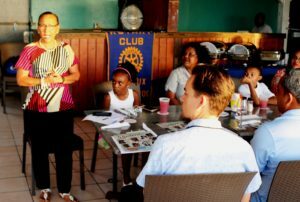 During their monthly session on the boardwalk overlooking the Christiansted harbor on May 9, St. Croix Rotary Harborside members presented eight laptops to Pearl B. Larsen Elementary School Principal Joan Claxton in the presence of students, teachers and other invited guests. Rotary Harborside President Desiree Wilburg told the gathering that the club secured a loan from the District Rotary 7020 to purchase the computers for the students. Principal Claxton thanked the Rotary Club for the generous donation and promised to use the laptops to help improve students’ learning in the computer lab.